When you configure a VPN on a router, any device connected to said router can be protected by the VPN. A VPN router can provide a host of benefits, including lowering the overall cost of securing all your home devices and enabling you to protect devices that don’t support native VPN apps. Although, for the non tech-savvy, the thought of a setting up VPN router might seem a stretch too far. However, it doesn’t have to be all that complicated. In fact, some VPNs even ship pre-configured routers so all the work is done for you. Even if you don’t go for that option, setting up a VPN router can be relatively straightforward. In this post, we’ll explain why you might want to set up a VPN router, the different routers and firmware, and which VPNs you may want to consider. 3 What router setup options do you have? 9 What about PPTP VPN? 11 Can I use a free VPN with a router? 12 Can I use a DNS proxy with a router instead of a VPN? Protect every device that’s connected to the router. This is especially helpful if you have more devices than are covered by a single VPN subscription. The industry standard is five devices per subscription, but a modern family or small business could easily have double that number of devices. Secure devices that are otherwise incompatible with VPNs such as smart TVs, game consoles, Roku, Chromecast, Apple TV, and other smart devices. This is especially relevant as we enter the age of IoT devices and „smart homes,“ where everything from the coffee maker to the washing machine could be connected to the internet. Use two VPNs at the same time to increase protection. You can configure one VPN at the device level and another at the router level. If either has flaws or becomes compromised, then you have an extra layer of protection. You could use two continuously or keep one as a backup option. Enjoy perks on all connected devices, such as the ability to access geo-restricted or blocked content from anywhere in the world. Some of the sites you can unblock include Netflix, BBC iPlayer, Hulu, and Amazon Prime Video, but there are lots more streaming, sports, gaming, and gambling sites to explore. All that being said, using a VPN router isn’t for everyone and certainly isn’t necessary. If all of your devices have support in the form of native VPN apps from a top provider, then you may not need to go to extra lengths by using a VPN router. For those who do decide they need a VPN router, various options are available. 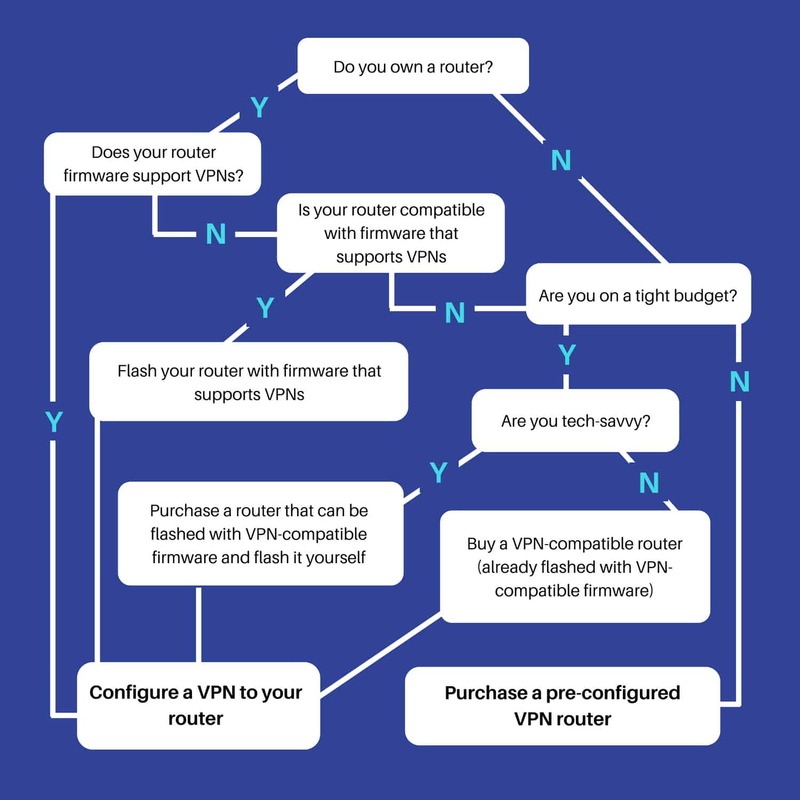 As will be revealed in this guide, there are decisions to be made about the router itself, which firmware you use, and the VPN provider you choose. Not every option in this guide is suitable for everyone. Depending on which type of setup you go for, setting up a VPN router can be a complex process. For example, flashing a router isn’t all that straightforward and can damage the router, possibly to an unusable state. Therefore, flashing—replacing a router’s firmware—may be best left to the more tech-savvy. Other options such as a pre-configured router are suitable for beginners. Depending on which option you go for, cost could be a barrier to some users. After all, you can protect multiple home devices through native VPN apps for just a few dollars per month, even with a top-rated service. At the other end of the scale, if you buy a pre-configured router, it’s could set you back anywhere from $200 to $500. However, for those who are willing to configure their own router, it doesn’t need to be that expensive. You can pick up a decent router (suitable for some applications) for under $100, and firmware is often open source and free. Of course, you’ll still have to pay the cost of the VPN subscription too, but this can be very reasonable. Diminished speed is a common complaint among VPN router users. Using a VPN on any device can slow down everyday activities such as browsing and downloading, and may increase the likelihood of lag or buffering when streaming or playing games. One of the big factors here is the VPN provider. Some VPNs slow things down more than others. This may be due to overloaded servers, network disruptions, or other issues. We regularly test the top-rated VPN providers for speed, so you can keep up-to-date with who is delivering the fastest speeds. You can see the result in the table below. The list of recommended providers at the end of this article takes into account speed as a major deciding factor. Once you are set up, connecting to a geographically close server should help ensure you get the best speeds your provider has to offer. Aside from the VPN you go with, another thing that can slow things down is the router processor. Many are not powerful enough to deal with VPN encryption, so ideally you want to look for one with at least 800 MHz of CPU. There are some new routers equipped with Intel Advanced Encryption Standard New Instructions (AES-NI), which can accelerate the speed of VPN encryption. One more factor that can slow things down is the size of the router firmware and your router’s RAM. If you’re flashing your own router and are worried about speed, select the smallest build of firmware that offers the features you need (in this case, compatibility with OpenVPN). Additionally, ensuring your firmware is up-to-date will help with speed too. As mentioned, a VPN router typically requires a bigger commitment than your average native app setup on a desktop, laptop or mobile device. It takes more time and depending on what option you choose, it might cost more money. So if you don’t want to commit, you’ll need to think about flexibility. For example, if you purchase a pre-configured router, you’re committing to that router, firmware, and VPN provider for the longer term. On the other hand, if you configure it yourself, but aren’t happy, either with the firmware or the VPN, it’s possible (albeit a pain) to start over. When deciding which router, firmware, and VPN service to go with, you’ll need to consider exactly how you’re going to be using your VPN router. This way, it will be far easier to make decisions about the final setup you need. The firmware you choose needs to support OpenVPN. It should also be up-to-date and equipped with the features you want. For example, some come with the capability to enforce policy-based routing, a kill switch, and more. Finally, the VPN you choose needs to be fast, reliable, and secure, and have servers in your desired locations. Plus, it should offer excellent customer support to help you if you run into any issues. What router setup options do you have? Buying a router that is pre-configured to a specific VPN provider’s servers. Using a VPN-enabled router that is already flashed with firmware that supports OpenVPN. You can then manually configure your chosen VPN to the router. Flashing a non VPN-compatible router with new firmware so that it can support using a VPN. Then you can manually configure your VPN to the router. These three are listed in order of ease of setup, with buying a pre-configured router being the simplest (albeit most expensive) option. In this section, we’ll examine each of these in detail, including some options for each. Before we do that, we’ve created a decision-making tool to help you make the right choice. If some of the options aren’t clear just yet, don’t worry; you can simply come back to this graphic as you make your way through the guide. This is hands down the simplest option for setting up a VPN router. In fact, there really isn’t much to set up. The major downside would be the cost and the other is flexibility. VPN providers will still honor their money-back guarantees, but there’s extra hassle involved in returning a router for reconfiguration. Most providers outsource their router pre-configuration to third parties such as FlashRouters and Sabai Technology. We’ll get to those in a little bit, but first, it’s worth calling out one provider that sells pre-configured routers, including exclusive firmware. That provider is ExpressVPN. ExpressVPN covers all the bases when it comes to VPN routers. It offers pre-configured routers through FlashRouters (see below). You can choose a router flashed with ExpressVPN’s own custom firmware or another firmware (DD-WRT, Tomato, or OpenWrt). If you decide to configure your own, the ExpressVPN firmware (which includes an easy-to-use interface) is available for download. This is hands down the best router firmware available. It’s way easier to set up and use than DD-WRT and Tomato. Plus it supports split tunneling so you can easily choose which devices go through the VPN and which don’t. Alternatively, you can configure the VPN with any other VPN-enabled router. Basically, ExpressVPN is suitable for any type of setup and has a ton of support documentation to help you. Just because FlashRouters carries routers for a particular provider doesn’t mean that VPN is a solid choice. You still need to do your research before selecting a provider that’s right for you. Our in-depth reviews are a great place to start. Some of the VPN services that FlashRouters has routers for. Note that when you buy a FlashRouter, you’ll have several options including whether you want a brand new or recertified router (for some models), an extended warranty, and a premium support plan. FlashRouters also sells routers that are not configured to a particular VPN but are pre-flashed with VPN-compatible firmware. Sabai Technology routers are a bit different than FlashRouters offerings. These ones come with the company’s own custom firmware, Sabai OS. This is based on the Tomato firmware which we’ll discuss in more detail later. These routers can be purchased with or without pre-configuration to a select VPN’s servers. Sabai Technology also sells some routers that are flashed with DD-WRT firmware, but you don’t have the option of VPN pre-configuration with these. 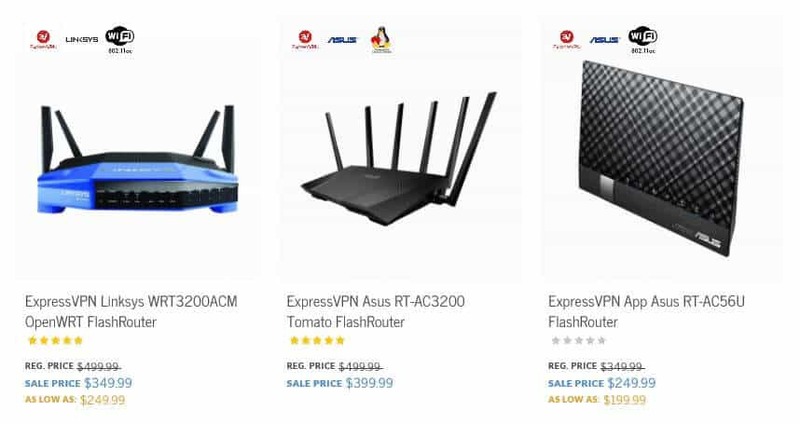 Routers range in price from around $145 to $500.The VPN pre-configuration costs an additional $19.99. 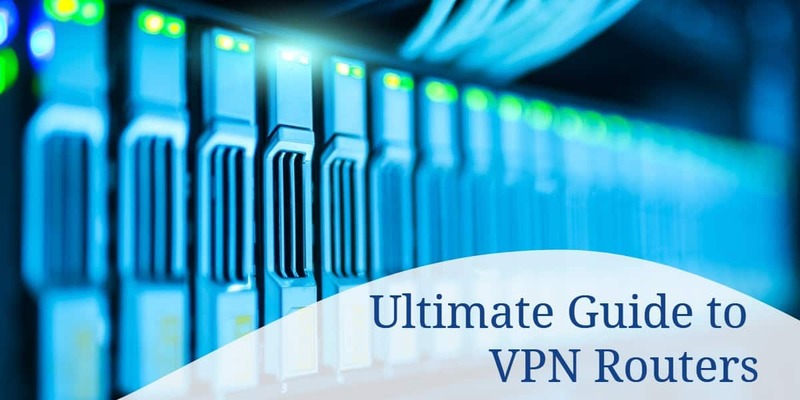 If you do go with a pre-configured router, you should still be able to avail of the money-back guarantees and trial periods offered by many VPN providers. However, the logistics of having to send back a router for reconfiguration or otherwise could be a pain. The policies surrounding these situations will vary depending on the router supplier and VPN provider. If you’re feeling up to configuring the VPN yourself, you can use a router that is already flashed with firmware that supports OpenVPN. A couple of VPN providers actually offer router apps that make setup a bit easier. For example, VyprVPN has an app that runs over Shibby Tomato. In any case, most top providers that can be configured with routers will provide corresponding documentation and support. So which router should you go with? There are seemingly endless options when it comes to VPN-enabled routers. However, the marketplace is littered with smaller companies whose products are likely unable to deliver the results you need. We’ll look at each of these in turn, but bear in mind that not all routers made by these manufacturers will work with a VPN. Asus routers come with stock firmware, AsusWRT, although this isn’t updated regularly. While this isn’t necessarily the best firmware option, it is easy to set up and it supports OpenVPN. Depending on the model, these routers may be purchased or flashed with other firmware, such as DD-WRT, Tomato (and derivatives), OpenWrt, and Sabai OS. Asus routers flashed with DD-WRT or Tomato firmware can be purchased through FlashRouters. Models flashed with Sabai OS are available through Sabai Technology, which currently has several Asus routers in its lineup. Linksys routers don’t usually support OpenVPN out of the box. However, you can buy pre-flashed Linksys routers through Sabai OS and FlashRouters. Depending on which model you choose, you can flash Linksys routers with compatible firmware, such as DD-WRT or Tomato. Sabai Technology offers one Linksys router model with Sabai OS firmware, and FlashRouters offers a few models with DD-WRT firmware. Some Netgear routers have a great reputation for being used as VPN routers. However, they don’t support OpenVPN out of the box. Like some Asus and Linksys routers, they can be purchased or flashed with firmware that supports OpenVPN. FlashRouters has multiple Netgear models flashed with DD-WRT firmware and one option for Tomato firmware. Sabai Technology has three models with its own Sabai OS firmware. This manufacturer doesn’t have a huge range of options, but it does offer some relatively inexpensive routers that come flashed with DD-WRT firmware out of the box, making them compatible with OpenVPN. Synology offers just two routers that can be used with a VPN, but they seem to be solid options. The company offers an add-on package called VPN Plus that can turn the router into a VPN server. If you want to have your router already flashed with your chosen firmware, your best bet is to go with a reputable provider such as FlashRouters or Sabai Technology. However, if you’re planning to flash your own, you’ll be able to pick up a router from an ecommerce site such as Amazon or in-store from somewhere like Best Buy. Let’s delve into each of these options! DD-WRT is a popular, free, open-source, Linux-based firmware. It’s based on the WRT firmware that was originally produced by Linksys for its WRT54G series of routers. DD-WRT is relatively easy to use, but can support a range of functionalities. It’s compatible with many routers and in most cases, it enables users to configure connections to OpenVPN servers directly from the router. We have a list here for the best VPNs for DD-WRT. Tomato firmware is free and open source and was first introduced in 2008. Since then, there has been several forks, including Shibby and Advanced Tomato. The original hasn’t been updated since 2010, is only compatible with a few routers, and doesn’t have OpenVPN client or server support. We have a list here for the best VPNs for Tomato routers. You might have also heard of TomatoUSB. This works with more routers and has has a broader range of features than Tomato, including USB port and wireless-N mode support. While it hasn’t been updated since 2010, there are forks that offer various features. One of the most popular is Shibby, while other options include Toastman, Victek, and Merlin. All of these have OpenVPN client and server support. Advanced Tomato is a fork of Shibby and is our recommended choice if you go with Tomato-based firmware. It offers everything that Shibby does, and keeps up with its updates, but also has a user-friendly dashboard. This makes it ideal for beginners and advanced users alike. One cool thing about AdvancedTomato is you can try before you buy with an official demo. OpenWrt is a relatively new firmware, but it’s gaining a solid fanbase. It’s highly customizable and has a wide range of add-ons available. Unsurprisingly, it’s pretty popular with developers, but its intuitive user interface makes it suitable for novices too. The OpenWrt project split in 2016 and a side project (LEDE) was formed. However, the two projects merged in 2018 and the current OpenWrt was born. One of the hurdles with this firmware is that — likely because it’s so new — there isn’t a lot of support documentation available. This one isn’t open source but comes as standard on any router you purchase from Sabai Technology. One standout feature that Sabai OS provides over other firmware is its Gateway feature. This is similar to the split tunneling found in ExpressVPN’s firmware and enables you to easily choose which devices go through the VPN and which ones go through your regular unencrypted connection. As discussed above, ExpressVPN is different from other VPN providers in that it has its own custom firmware. This is super easy to set up and use and includes a split tunneling feature. You don’t have to buy a pre-configured router to use the ExpressVPN firmware. It’s free to download and can be flashed to compatible routers. Note: These are very basic guidelines and you should seek detailed instructions for your particular setup before flashing. This process, if carried out incorrectly, can ‘brick’ your router and render it useless. Ensure your router is compatible with your chosen firmware. Download the latest stable build of the firmware for your router. Note that some router and firmware combinations require temporary firmware to be installed first. Log in to your router’s’ admin page and go to the admin section. Choose Firmware Upgrade>Select File and select your firmware. Upload the file and then you should be able to simply wait until the update has finished. Again, these are very basic instructions and will vary depending on your router and firmware. You might also find detailed tutorials on your chosen VPN provider’s website and can always contact the customer support team for help. So far, we’ve only talked about setting up a VPN router over the OpenVPN protocol. You may have comes across some literature that talks about PP2P being an option. However, PP2P is not considered secure and bears a long list of vulnerabilities that are considered unfixable. As such, it should only be used as a last resort. Nonetheless, if you do find yourself wanting to use PPTP for whatever reason, there should be guides available, such as that provided by Sabai Technology. One of the big decisions you need to make when setting up a VPN router is which VPN provider to go with. Not all are compatible with router configurations, and some that are lack support in the form of setup guides and customer service. 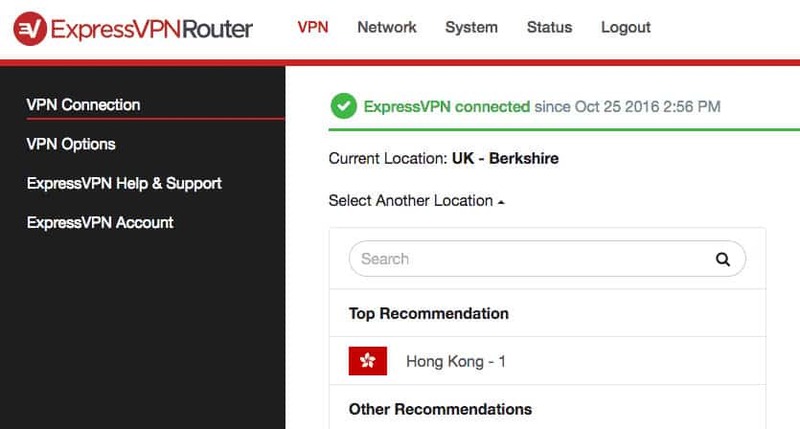 ExpressVPN is definitely the best provider for VPN routers. It goes to great lengths to ensure that options are available for every type of user, from beginner to advanced. It even makes its own router firmware which can be flashed to a compatible router and is easy-to-use. Alternatively, as mentioned, you can buy a router already flashed the firmware and pre-configured with ExpressVPN servers. This service isn’t limited to working with its own firmware and is compatible with others including DD-WRT, Tomato, and OpenWrt. ExpressVPN has plenty more to offer than just router setup. It boasts a huge server network that spans almost 100 countries. All servers are optimized for speed and this service can unblock a bunch of popular streaming sites, including Netflix, BBC iPlayer, Amazon Prime Video, Sky Go, and more. It provides top-notch customer support, so whether you’re setting up a VPN router or simply trying to access Netflix, you’ll get a prompt and knowledgeable response from the 24/7 live chat customer service. Security and privacy are top of mind for this provider and you’ll benefit from 256-bit encryption, leak protection, and a kill switch (dubbed a “network lock”). It keeps minimal logs and never records your IP address. Aside from being compatible with routers, ExpressVPN has apps for Linux, Windows, MacOS, iOS. and Android. It allows for three simultaneous connections per account, so you can cover your home router plus two mobile devices. SPECIAL DEAL: Our readers get three months free on a one-year ExpressVPN plan. Every subscription is backed by a 30-day money-back guarantee, so you can try it risk-free. 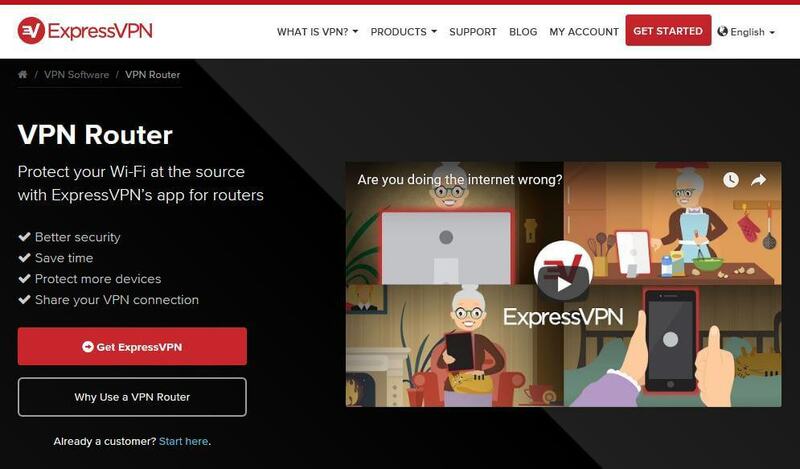 See ExpressVPN’s router setup guides. NordVPN is another provider that offers pre-configured routers, so you don’t need to go through any of the hassle of setup. Alternatively, NordVPN can be configured to routers flashed with compatible firmware. It offers a ton of documentation and is one of the few providers to provide a tutorial for setup with OpenWrt. A live chat team is available to help you in case you run into issues. NordVPN runs a massive network of more than 4,500 servers optimized for different purposes including P2P, double VPN, and Tor over VPN. It has fast speeds and can unblock popular streaming sites, such as Netflix, Hulu, HBO, Amazon Prime Video, and BBC iPlayer. You’ll have no issue on the security front with “military-grade” 256-bit encryption, a kill switch, and leak protection. No logs are kept, so all of your activity remains completely private. Automatic wifi protection is an added bonus if you decide to use the VPN on a mobile device. Six simultaneous connections are allowed per subscription and apps are provided for Windows, MacOS, iOS, and Android. READER DEAL: Save 77% and pay only $2.75 per month when you buy a three-year plan. See NordVPN’s router setup guides. IPVanish is another provider offering pre-configured routers if you want to save yourself some hassle, but you can configure it to other compatible routers instead if you want. IPVanish doesn’t have live chat customer support, but it offers lots of help in the form of router setup tutorials. Plus, you can submit an email form any time of day and will typically get a quick response. Security is in the form of 256-bit encryption with perfect forward secrecy and this comes with leak protection and a kill switch. No logs are kept whatsoever, so all your information remains private. IPVanish is especially popular with Kodi users and will work with all of the official Kodi addons. Aside from router configuration, you can download apps for Windows, MacOS, iOS, and Android. IPvanish allows you to connect up to 10 devices at a time. EXCLUSIVE OFFER: Get big discounts of up to 60% on IPVanish plans. See IPVanish’s router setup guides. PrivateVPN doesn’t offer pre-configured routers but it can be configured to certain routers manually. 24/7 live chat support can help with setup and troubleshooting. This is a small provider, but the service is fast, reliable, and excellent for unblocking streaming services such as Netflix, HBO, Amazon Prime Video, Hulu, BBC iPlayer, and lots more. It’s secure and private, boasting 256-bit encryption over the OpenVPN protocol, leak protection, and a kill switch. It maintains no traffic or connection logs, so has no information to hand over to a third party. If needed, you can download apps for WIndows, MacOS, iOS, and Android. Six connections are allowed on a single plan. SAVE OVER 70%: Comparitech readers can save more than 70% plus get five months extra for free. See PrivateVPN’s router setup guides. CyberGhost is an increasingly impressive provider and its VPN can be configured to routers with a range of firmware, including DD-WRT and Tomato. This is another provider with customer support at top of mind and you’ll have access to a live agent at any time of day. CyberGhost operates a growing network of more than 2,500 servers and provides easy access to lots of popular streaming sites, including Netflix, Amazon Prime Video, and BBC iPlayer. CyberGhost keeps no logs at all that can be tied to an individual user. It uses security standards that match the best in the industry, including 256-bit encryption, a built-in kill switch, and leak protection. If you decide to use it on your mobile device too, you can set up automatic wifi protection for familiar networks. This provider allows up to seven simultaneous connections, and each plan includes access to native apps for Windows, MacOS, iOS, and Android. READER OFFER: Choose a one-year CyberGhost plan and enjoy over 70% off plus an extra six months free. Can I use a free VPN with a router? When deciding on a VPN service to use with your router, there are several factors you need to look out for, including speed, reliability, security, and customer support. Unfortunately, a free VPN will typically fall short on all of these fronts. Because they’re free, they often have a large number of users clamoring to use a limited number of servers. This can lead to slow, unreliable connections, and you may even have to join a queue to connect to a server. What’s more, free VPNs are less likely to be able to access blocked content such as Netflix and BBC iPlayer. Free VPNs are often lacking on the security and privacy side of things, too. While they might advertise decent encryption, it has been shown that some don’t encrypt your data at all and may even carry malware. Other shady business tactics include tracking your activity and selling the data to third parties, injecting ads, and even stealing idle user bandwidth. Clearly, this isn’t the kind of service you want after you’ve gone to the trouble of setting up a VPN router. Paying a few bucks per month for a top-rated provider is worth the peace of mind. Can I use a DNS proxy with a router instead of a VPN? If your main reason for using a VPN router is to bypass geo-restrictions, then you might look at a DNS proxy service as an alternative. This can mask your IP address and replace it with another, enabling you to unblock streaming sites and other geo-locked content. DNS proxies only re-route your connection when you access a site that requires geo-unblocking. For example, when you go to Comparitech, the site is the same no matter where you access it from, so the proxy doesn’t kick in and you get a direct connection. When you go to Netflix, the DNS entry has been changed so that your connection is routed through a proxy server. Although, some DNS proxy services fall under the same umbrella as free VPNs in that they often won’t work with some of the streaming sites that are aggressively blocking the use of proxies. One DNS proxy that doesn’t have this problem is ExpressVPN’s MediaStreamer, which comes bundled with every subscription. Aside from the above, one of main differences between a DNS proxy service and a VPN is encryption. A VPN encrypts your traffic whereas a DNS proxy doesn’t. So if you’re at all concerned about security, then a VPN is the way to go. You can learn more in our recent post about smart DNS proxies and how to configure one to a router.